I haven't made a brayered card for a while ... so yesterday afternoon I went surfing the 'net for inspiration. There are wonderful photography sites that have hundreds of pictures of nature scenes, some of which would translate nicely into a brayered card. I found a picture of a lone winter tree in a snow-covered field. The coloring of the sky turned out very close to the picture ... and definitely conveys a cold, winter day. 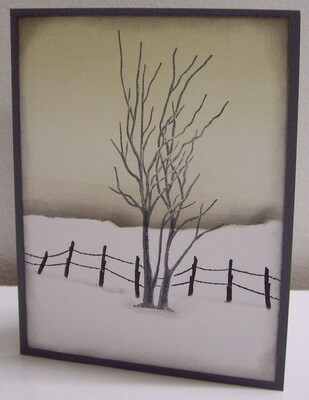 Stampscapes has incredible stamps and I used two for the card below (Leafless Limb & Old Fence). Hope you like. I ripped a mask from the post-it note and used it to cover the snow area. I inked my brayer with Sahara Sand and brayered from the post-it note edge, upwards ... creating a gray haze above the snowline. Next I brayered in River Rock, starting at the top of the sky and moving downwards until it reached the gray area. I used a small sponge dauber to add Basic Gray ink along the horizon line. I removed the mask (keep for later use) and stamped the leafless limb tree in Basic Gray ink just off-center. Using the Stamp-a-ma-jig for placement, I inked the Old Fence stamp in Basic Black and stamped it a couple of times. I placed the post-it note mask from earlier along the bottom of the fence and sponged more Basic Gray ink to create a shadow under the fence. I also sponged a little at the bottom of the tree. To finish, I sponged more Basic Gray ink along the bottom, top and sides of my main panel. I mounted the panel onto a card base of Basic Gray cardstock.